Click here to visit George’s website at iamfarms.com and here to see our post on Forza’s farm day at one of George’s locations. George signing his second loan with Forza Financial in November 2018, seated be former CEO, Jon Hanley. George Poindexter is the owner and founder of I AM FARMS, an organic farming operation near Greensborough, AL. 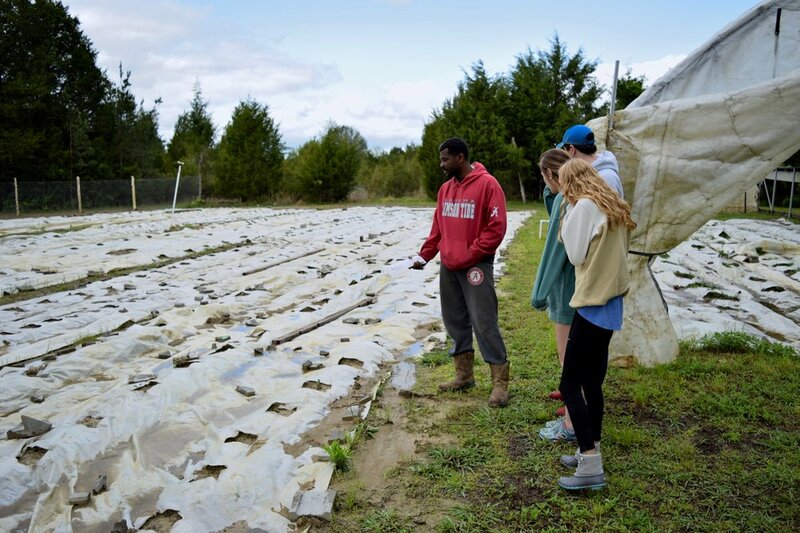 George, a 2005 graduate of the University of Alabama, started the farm in 2016 with a vision of providing organic produce to those in Alabama with little access to healthy food sources. He grows a variety of produce, most notably tomatoes, squash, okra, cucumbers, and pumpkins. George wishes to make a difference in addition to simply making a profit, as he believes everyone should have access to fresh, non-GMO vegetables. George became more health conscious and started paying attention to the source of the food he consumed on a daily basis. He researched the number of organic brands on grocery store shelves and the percentage of stores selling organic produce, discovering both were on the rise. After learning that 95% of the organic produce consumed in Alabama is from out of state or country, George saw an opening in the market for organic suppliers. “Back to the Farm”, a short documentary on George’s organic farming efforts by Forza employee, Ilham Ali. Despite his previous farming experience, George had never once worked on an organic farm, which utilize alternative planting methods in order to compensate for not using any GMO seeds or chemicals such as pesticides. In order to educate himself, George watched instructional videos and read blogs about organic farming, as well as created partnerships with established organic farmers who helped him get started. As a startup, the operation faced a great deal of financial uncertainty. George discovered that the bottleneck for increasing sales proved not to be finding customers, but acquiring the funds to grow more produce to sell. His search for alternative sources of capital led him to Forza. On April 17th, 2017, we gave George a $4,000 loan to clear a plot of land so that he could plant in the appropriate season. Additionally, he used the contacts and experience he gained through his previous job as a UPS salesmen to connect with Whole Foods, who directed him on how to become originally certified. After completing the two year process in October 2018, George is now able to double the price of his produce, as well as become a supplier to three Whole Foods locations in Alabama. George shows his farm to several Forza employees during Forza’s “farm day” in May 2018. Recently, Forza granted George a second loan for $5,000 on November 12th, 2018 which he will use to purchase a refrigerator for surplus produce. George has big plans for 2019, as he plans to start selling direct to consumers, allowing anyone to order durable vegetables like okra, kale, and squash to their doorstep. He also aims to integrate an app onto his website (iamfarms.com) to allow customers to see how many pounds of produce have been harvested and are available for purchase. Next year, Forza plans to assist George with advertising and other areas of business.